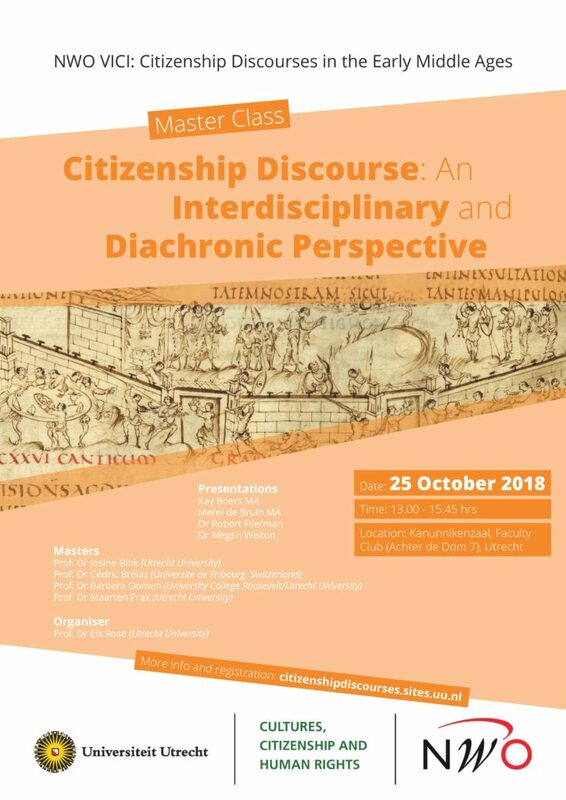 On Thursday October, 25 2018 a Master Class will take place on Citizenship Discourses: An Interdisciplinary and Diachronic Perspective. 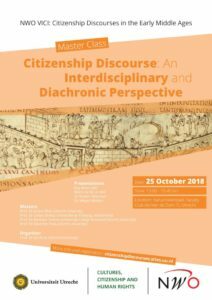 This Master Class is part of the NWO VICI Project Citizenship Discourses in the Early Middle Ages, 400-1100, guided by prof. dr. Els Rose (2017-2022), and is supported by the research focus area Culture, Citizenship, Human Rights (CCHR). During the Master Class the members of the VICI-team will present their individual sub-projects. In a variety of topics and forms all team-members study citizenship discourses in the period between the end of the Roman Empire in the West and the development of medieval urban culture around the beginning of the second millennium. Their presentations will be followed by responses by the Masters. After the Master Class Cédric Brélaz, Professor of Ancient History at Fribourg University, Switzerland, will provide a plenary lecture in the Lecture Series 2018-19 organised by the Utrecht Centre for Medieval Studies on “Competing citizenships in the Greek-speaking provinces of the Roman Empire: communis patria vs local patris“. 1. Rapp, C., & Drake, H. (Eds.). (2014). The City in the Classical and Post-Classical World: Changing Contexts of Power and Identity. Cambridge: Cambridge University Press. doi:10.1017/CBO9781139507042, p. 1-37, 240-256. The Master Class is open to all, including students. RMA-students and PhDs are particularly welcome to attend both the Master Class and the following lecture. or send an e-mail to citizenshipdiscourses@uu.nl.